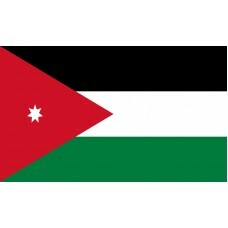 The Jordan Flag features three horizontal bands and a triangle on the hoist side. The bands are colored black at the top, white in the center, and green on the bottom. These colors are representative of periods of Muslim history, and are shown on many flags throughout the Middle East. Black is synonymous with the Abbasid, or third Caliphate which was established after the death of the Prophet Muhammad. White represents the second Caliphate, the Umayyad. The red band symbolizes the Fatimid Caliphate. The red triangle is representative of Jordan's ruling kingdom and historic struggles in the Middle East. The seven pointed white star at the center of the red triangle symbolizes the seven hills upon which Jordan's capital city, Amman, was built. The star's central location in the red triangle is a symbol of Arab liberation from the Ottoman Empire. All of the colors of the Jordan flag are symbolic of the Pan Arab movement. Jordan is situated in part of the Middle East which has been and remains a center of religious and political contention. The country adopted its current Pan Arab flag design in 1928, to signify Jordan's independence as an Arab nation after centuries of colonial occupation. The name Jordan refers to the Jordan River, which separates the country from Israel and Palestine to the west. The Jordan River has an important significance in the three major world religions of Judaism, Christianity, and Islam. The country itself was called Trans Jordan, meaning "across the Jordan," by its previous occupiers, who were the British Empire. 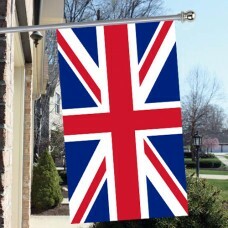 The British controlled the country until 1946, as part of the British Mandate for Palestine, which was established by the League of Nations in 1923. The red triangle in Jordan's flag is held to be a symbol of the Hashemite dynasty, which provides the country's current head of state, King Abdullah II. Jordan is officially called The Hashemite Kingdom of Jordan, making it the only Arab country with a monarch. The term "Hashemite" refers to Hashim ibn Abd Manaf, who was the great grandfather of the Prophet Muhammad. Jordan is a land with great significance to millions of people across the world. The Jordan River itself forms much of the country's western boundary, and most of Jordan's rainfall is in the north west of the country. This is the heart of Jordan's agricultural industry, which feeds much of its people. East of this area, the country is very dry and sparsely populated. 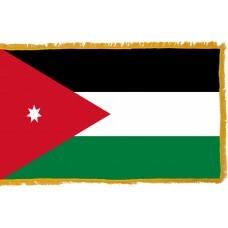 The flag of Jordan symbolizes the country's struggle to become an independent Arab nation. It is one of the most stable countries in the Middle East, despite pressures from outside its control. 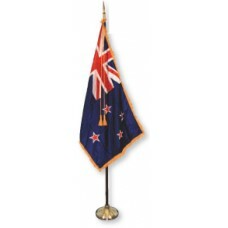 Its flag has remained the same for almost a century, which is testament to this resilient nation.